Thought I'd do a combined post on these two movies as both have single word titles, are set post-WWII, and both have strong leads torn between what's comfortable and taking risks. 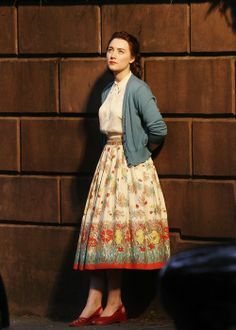 BROOKLYN stars Saoirse Ronan (Atonement, Grand Budapest Hotel) as Eilis a young Irish woman who can't find decent work in their small town of Enniscorthy, so her older sister who treats her almost like a daughter, even though they both live at home with a loving mother, arranges for her passage to America through a priest in New York who also secures Eilis a job in a department store and a place to live in a female boarding house. I was excited by the fact that the screenplay, based on a novel by Colm Tóibín's, was adapted by one of my favorite screenwriters Nick Hornby. Most people love his screenplay for the John Cusack classic boombox of love, High Fidelity. But my favorites are Hugh Grant in About a Boy and Carey Mulligan in An Education, I can watch both of these movies again and again. I should also mention Hornby wrote last year's Reese Witherspoon trek along the Pacific Crest Wild. (which I saw but never got around to writing a post). Hornby observes: "I think Eilis can see a life in America and she can see a life in Ireland, but she cannot maintain those two pictures at once. She knows you cannot square these two lives. So I think that's how she momentarily manages to love two people at once, because they are in separate worlds. But ultimately, she has to live in just one." And this is the gist of the film, and I truly felt torn about her decision. 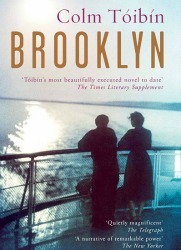 In the beginning Eilis has no choice and must come to America, and manage through homesickness, become accustomed to new surroundings and a way of life; then just when she's at a breaking point of loneliness, she meets Tony Fiorello (Emory Cohen) an Italian plummer who still lives at home and has a thing for Irish girls. Their romance is played out sweetly and old-fashioned, with plenty of hand holding and respectable dates, much to the delight of Eilis's no-nonsense landlady. A death in the family takes Eilis back to Ireland for the funeral, where everything about Enniscorthy seems wonderfully the same, yet now filled with possibilities. She receives an immediate job offer and reacquaints herself with a boy from town, Jim (Domhnall Gleeson Ex Machina) who's now very eligible and very interested in Eilis. But what about the life she started and promises she made back in Brooklyn? Bottomline: It's not going to be a movie I watch again and again like the other two Hornby penned movies mentioned above, but it's worth fitting in this busy holiday movie season. TRUMBO I think I first learned about the Hollywood Blacklist the first time I saw Barbra Streisand and Robert Redford in The Way We Were, which I saw at maybe age 10 or 11 and didn't really understand that part of the movie. I still don't understand how such a crazy thing was able to happen right here in the United States -"The Land of the Free" and that it could happen to rich people to boot! Of course if Donald Trump gets elected, we could be seeing more of this kind of dangerous thinking (not affecting rich people) but affecting people's civil liberties and completely going against everything this country stands for. 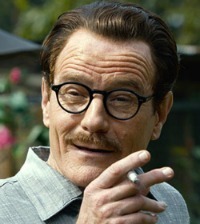 Bryan Cranston is once again outstanding. Love his characterization of Dalton Trumbo a real life Hollywood screenwriter who went from being the highest paid in the business to being Blacklisted and held in contempt of Congress under the House Un-American Activities Committee (HUAC) in 1947, simply for not answering questions about his political views. Trumbo is directed by Jay Roach (Austin Power, Meet the Fockers) he imbues the movie with a sense of humor and light absurdity which keeps it from feeling too heavy. It was written by John McNamara who first heard the story of Dalton Trumbo when he was studying screenwriting under two members of the former "Hollywood 10" Ring Lardner Jr., and Waldo Salt along with Trumbo supporter Ian McClellan Hunter. McNamara saw an opportunity to create a film that could encapsulate the turbulent politics of that volatile era in American history in a personal story. Going into the movie, I knew what it was about, but I was under the impression it was Hollywood vs The Government. I never knew Hollywood turned on itself. Members of the HUAC were made up of Hollywood insiders like John Wayne (David James Elliott), Hedda Hopper (Helen Mirren) and Ronald Reagan. Others like Edward G. Robinson (Michael Stuhlbarg) were forced to turn on their friends and colleagues or lose everything. Bottom line: Trumbo is not only a history lesson and a tale of caution, it's got some killer witty lines. Diane Lane is stalwart as Dalton's wife Cleo and John Goodman does a good turn as a B movie producer who lucked out being able to hire Trumbo for a steal!